“As soon as the invite came in, we knew what a privilege this would be and were very excited. This product is known to be very special and it did not disappoint! For anyone not wanting to fly or nervous about travelling alone, it could not be better. You simply get a train (direct York to Glasgow in our case) where you are met and taken to the ship. 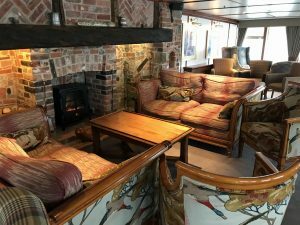 From the moment you step on board the Hebridean Princess, it feels like a very homely country house hotel. The décor reflects this and the staff could not be more welcoming and friendly. 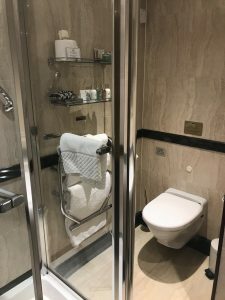 Our cabin was spacious with all amenities (including Molton Brown products) and during the 2 day trip we got to see most of the cabins & suites which were all lovely. 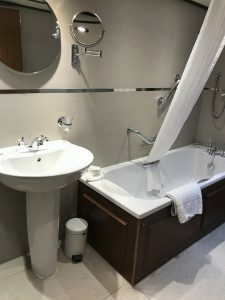 Unusually, there are a lot of single cabins and they do not charge a huge surcharge that other companies sometimes do. In fact, these cruises are perfect for the single traveller. Firstly, you only have a train journey to negotiate and from then on you are treated like a VIP! 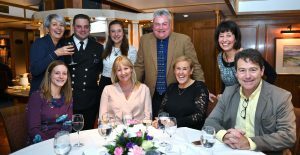 The restaurant has mostly tables for 2 (which is rare) apart from the large tables for the single travellers who are sat together and entertained by the captain & officers. The food was wonderful and the wine extremely good. The whole trip is fully inclusive, you will literally only pay for any items bought in the shop! 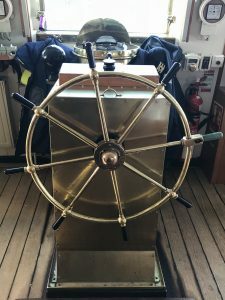 All food, premium drinks including champagne, gratuities, excursions, entrance fees, guides & guest speakers, bicycles, internet, transfers or car parking are included. 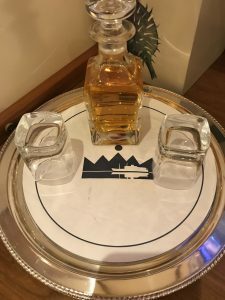 The excursions are hand-picked and special, for example we were taken to Mount Stewart House which was opened specifically for us and we enjoyed a private tour which included rooms & exhibits that are not available to the general public. 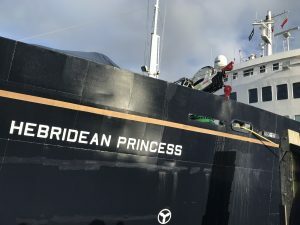 This is the regard for Hebridean Cruises! 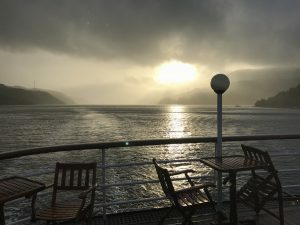 We absolutely loved our 2 night trip and can see why nearly 70% of passengers are repeat guests. 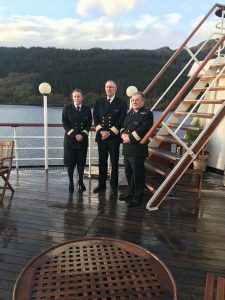 It was recently featured on TV in a documentary with Richard Wilson but even better than that, HRH The Queen and royal family have taken a private charter of her twice! What better recommendation is there?! 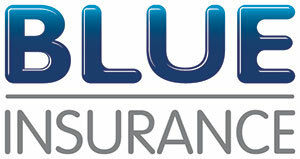 It is not at all ‘stuffy’ though as the incredible staff ensure that the atmosphere is relaxed, welcoming, & congenial. You would be among friends in no time! 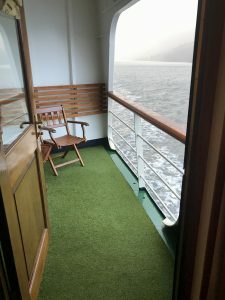 We’ll be honest, you do need a certain level of mobility as it is an old ship so has steep & narrow staircases but as long as you can get yourself up the gangway onto & off of the ship you could book a cabin on the main deck to avoid the stairs. 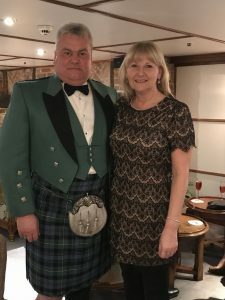 These cruises are not cheap but you must consider what is included and the level of service you receive. It would be the most special way to celebrate a big birthday or anniversary. You would certainly never forget it! 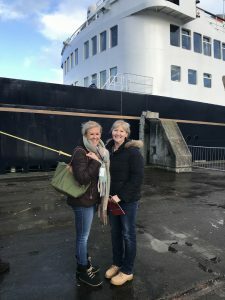 Hebridean Island Cruises not only sail the Scottish islands but also offer European river cruises, Isles of Scilly, Channel Islands, Norway, France and Belgium and they do short duration taster cruises if you want to see what it’s all about before booking a longer holiday. Error: Error validating access token: Session has expired on Monday, 01-Apr-19 06:23:33 PDT. The current time is Thursday, 25-Apr-19 22:37:43 PDT.